Jesus asked Mary Magdalene this question outside the tomb on resurrection morning. Mary had been through hell the last 3 days. She had watched a Person she loved be arrested on false charges, mocked, tortured and finally hung up to die in agonizing pain and public humiliation. Her religious leaders had betrayed her. Her friends were confused - dazed. All her hopes and dreams were shattered. She had believed Jesus was the Messiah. She had invested everything she had in Him…and now it was gone…wasted…useless…. She wanted to die herself. The meaning of life had been taken away. The only thing she could do was go with her friends to properly prepare the body for burial. But now the body was gone…stolen…would this nightmare never end? She rushed back to tell the disciples who were hiding in fear and accompanied two of them back to the empty tomb. They were no help… no encouragement. This was the last straw. This was the end. She turned thinking it was the gardener who might be able to tell her where the body was. If it had been the gardener then perhaps we could understand the question. But Jesus? Who knew better than He what had happened in the last three days? 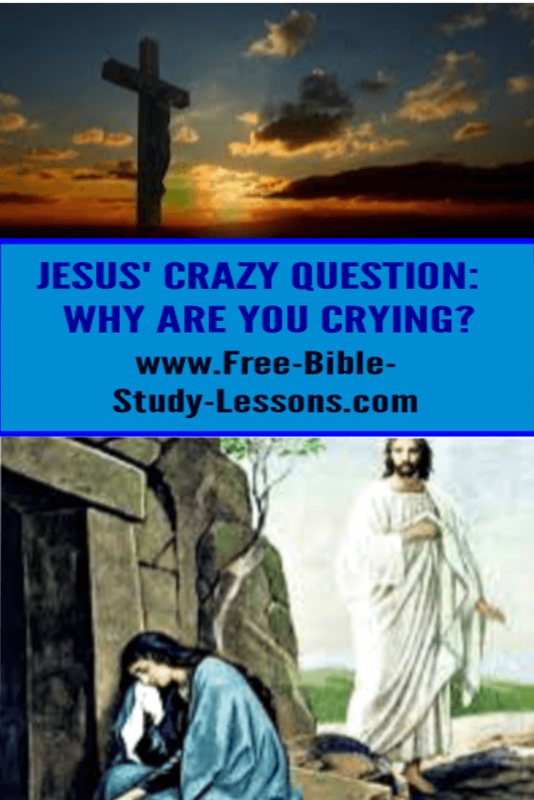 Who knew better than He why she was weeping by the tomb? Why such a crazy question? Like us, many times, Mary was trapped in the moment. She couldn’t see ahead. All she could do is feel the pain coursing through her raw emotions. But Jesus knew what she did not. The time for tears had passed. Mary was standing on the verge of the greatest revelation in the history of the world. Mary was just about to find out that 4,000 years of prophecy had just been fulfilled. Mary was about to be honoured as the first person to witness the Resurrection - the event that would change millions upon millions of lives and the very course of history itself. She was there. She was experiencing a moment that would never come again…not to her…not to anyone! Sin was destroyed! Satan defeated! The Kingdom of God was come! Eternal Life given to all who would accept it! Within the next few minutes she would be entering the most exciting time of her life. Joy would overflow. Tears would be no more. Jesus was alive! It was going to be ok! Yet now she was crying but she didn’t know…she couldn’t see…but a tender voice asks a crazy question…trying to draw her from herself and raise her vision. Yes, there is a time for crying. Yes, we do sorrow - but we do not sorrow as those who have no hope. Christ is risen! In Him there is always hope for the future.